Have a Holly Jolly Christmas this year. 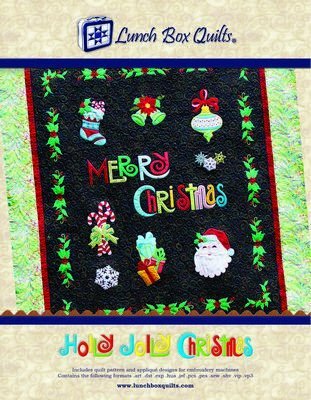 Contains thirteen embroidery designs that feature images from your favorite Christmas as a child. Use the designs to make a full sized quilt or decorate for the holidays with a wall hanging. Two quilt patterns are included to make a 54x62in large quilt, or an 18x44in wall hanging. Package comes with embroidery designs on CD and a redemption code for downloading. Embroidery designs in the following formats: ART, DST, EXP, HUS, JEF, PCS, PES, SEW, SHV, VIP, VP3.